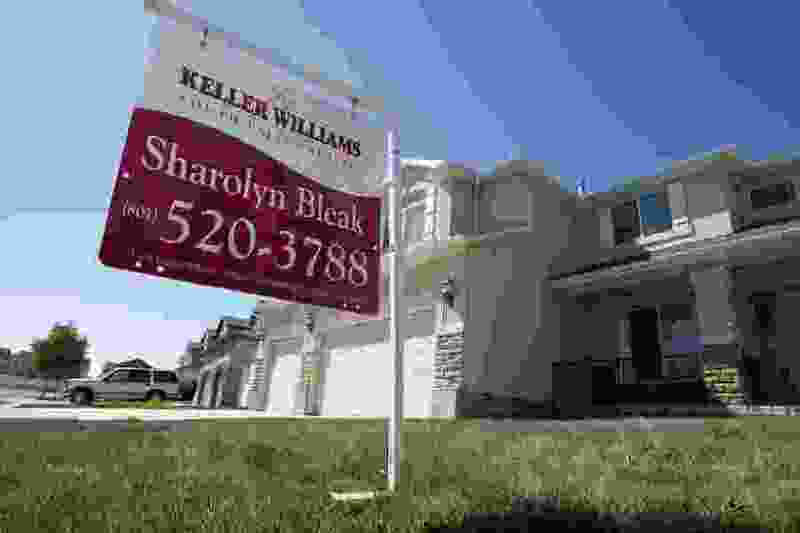 (Steve Griffin | The Salt Lake Tribune) Mortgage rates continued their upward march this week. Mortgage rates continued their upward march this week. According to the latest data released Thursday by Freddie Mac, the 30-year fixed-rate average climbed to 4.6 percent with an average 0.4 point, its highest level in nearly two months. (Points are fees paid to a lender equal to 1 percent of the loan amount.) It was 4.54 percent a week ago and 3.93 percent a year ago. The 15-year fixed-rate average grew to 4.08 percent with an average 0.4 point. It was 4.02 percent a week ago and 3.18 percent a year ago. The five-year adjustable rate average rose to 3.93 percent with an average 0.2 point. It was 3.87 percent a week ago and 3.15 percent a year ago. "Mortgage rates trended higher over the past week as President Donald Trump and European Commission President [Jean-Claude] Juncker agreed to avert a trade war toward the end of the week, easing some of the trade tensions that had been putting downward pressure on rates," said Aaron Terrazas, senior economist at Zillow. "Strong Q2 GDP data released on Friday also contributed to the trend, but strong data were largely expected and already priced in to rates. The strength of the economy was reinforced in Wednesday's [Federal Open Market Committee] statement, solidifying expectations for future rate hikes this year." When the Federal Reserve met earlier this week, it did not raise interest rates, but it did signal a September hike was likely. The central bank has raised its benchmark rate twice this year and indicated that two more increases are possible before the end of the year. The Fed doesn't set mortgage rates, but its decisions influence them. A better indicator of where rates are headed is the movement of long-term bonds. This week, the yield on the 10-year Treasury crossed the 3 percent threshold. It hadn't closed at 3 percent since late May. When yields rise, so do home loan rates. Bankrate.com, which puts out a weekly mortgage rate trend index, found that nearly half the experts it surveyed say rates will move higher in the coming week. Elizabeth Rose, a sales manager at Nations Lending, is one who expects rates to go up. But Michael Becker, a branch manager at Sierra Pacific Mortgage, makes the argument that rates are likely headed down. "The rise in Treasury yields and mortgage rates over the last couple weeks has more to do with increased supply of Treasurys to finance the Trump tax cut than concern over the Fed hiking rates," Becker said. "Once the bond market acclimates to this higher supply, I think some bond investors will be drawn by the higher yields and look to buy. This will help drive rates a little lower in the coming week." 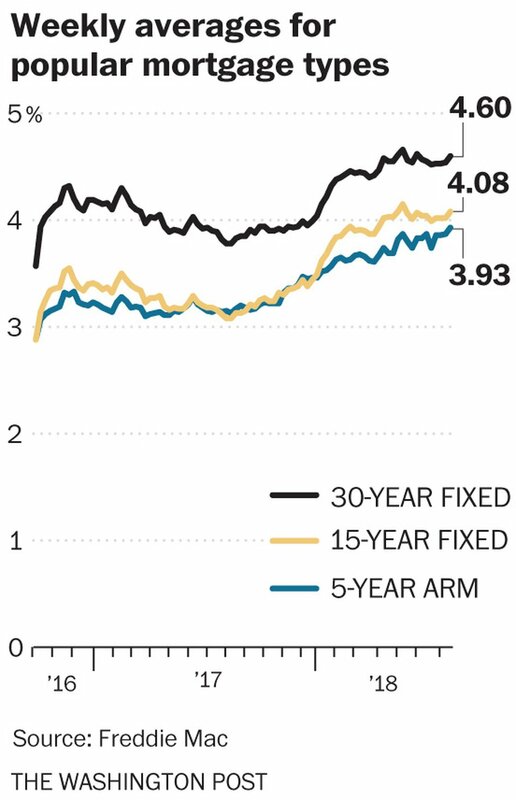 (The Washington Post) Weekly averages for 30-year and 15-year fixed-rate mortgage rates, in percent. Meanwhile, mortgage applications declined for the third week in a row, according to the latest data from the Mortgage Bankers Association. The market composite index — a measure of total loan application volume — decreased 2.6 percent from a week earlier. The refinance index fell 2 percent, while the purchase index dropped 3 percent. The refinance share of mortgage activity accounted for 37.1 percent of all applications.